The apes are actually a species of tailless monkey called Barbary Macaque. While their macaque relatives in Algeria and Morocco are endangered species, the Gibraltar apes are doing very well. There are now by some reports about 300 living in five bands around the Rock. Gibraltar's apes are the only free-roaming bands of monkeys in Europe. 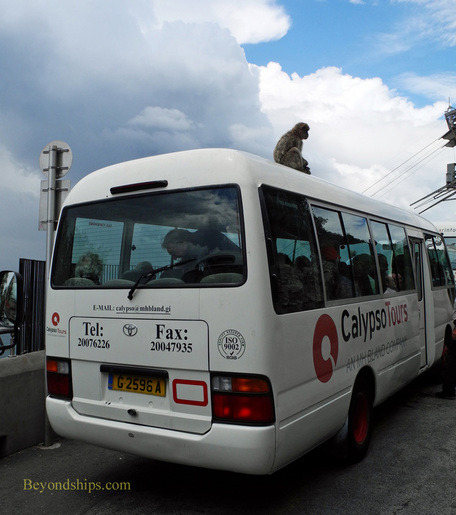 A number of theories have been posited as to how the apes came to Gibraltar. One legend has it that there is a tunnel under the Straits of Gibraltar known only to monkeys, which allows transit between the two continents. Another theory is that they are the last of a line of macaques that once inhabited all of Europe. However, the theory that has the most currency at the moment is that they are escaped pets brought over either by the Moors or by the British when they conquered Gibraltar. Actually, there is no mystery as to how the ancestors of most of today's apes arrived in Gibraltar. 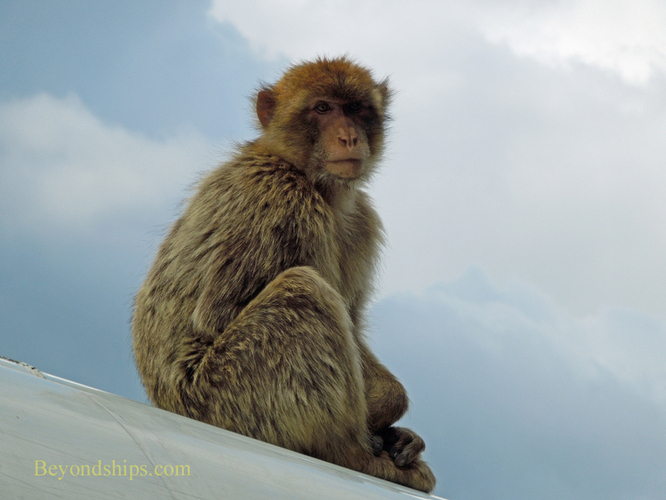 There has long been a legend that if the Barbary Apes ever disappear from Gibraltar, the British will also disappear. During World War II, the number of apes had dwindled down to seven. Prime Minister Winston Churchill concerned about wartime morale, ordered that the military reenforce the Gibraltar band with macaques from Africa. In ordering the military to intervene, Churchill was not expanding the military's responsibilities. Since the British took over Gibraltar in 1704 until 1999, the apes were the responsibility of the British military. An officer was assigned to look after them. Births and deaths were gazetted. 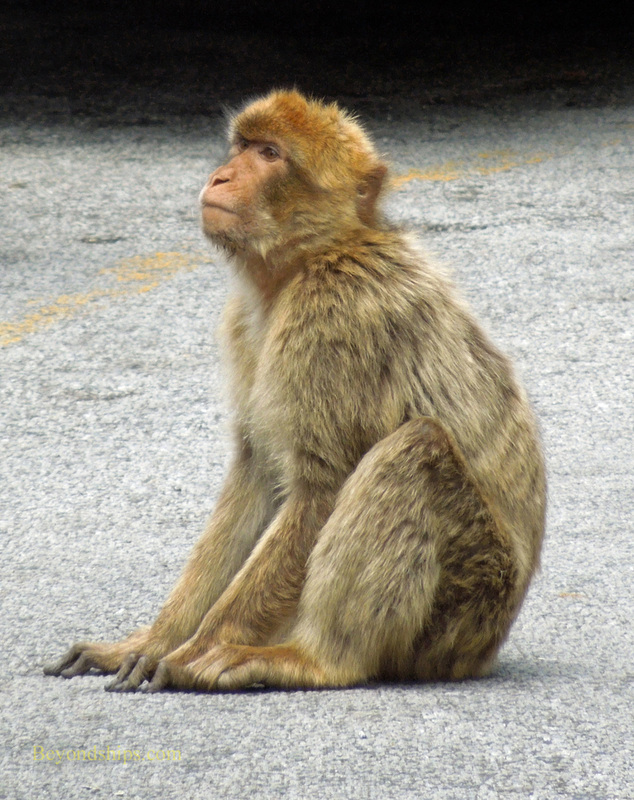 Sick apes were treated at the Royal Naval Hospital in Gibraltar. 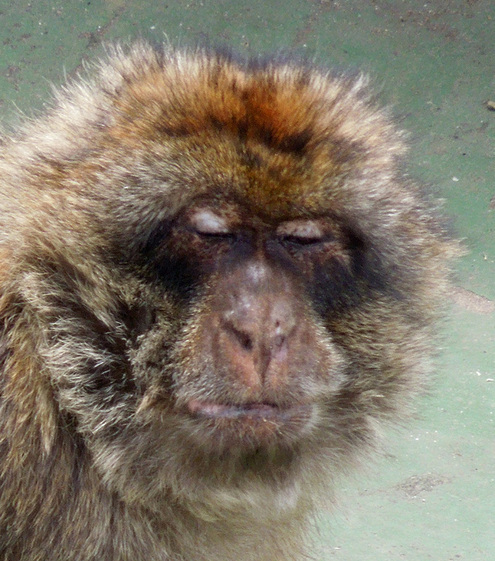 The apes have been mustered out and now are under the care of the Gibraltar Ornithological and Natural History Society. Naturalists and veterinarians tend to their needs. This includes feeding the apes a healthy diet designed to supplement what the apes forage in the wild. Above: An ape who has seen it all before. Below: For some, the visitors are still interesting. Above: Wandering among the visitors. Below: Ready for a ride. The apes live in a nature reserve on the Rock. Often when you visit a nature reserve, you spend much of the day hoping for a few seconds glimpse of the wild animals. Not so here. The Apes wait in plain sight for the cable cars arriving at the station at the top of the Rock as well as for the taxis and mini-buses that crowd the Apes Den. They are not shy. Indeed, visitors receive numerous warnings about interacting with the apes. Visitors are told to look but do not attempt to touch as these cuddly-looking primates can display their annoyance by taking a good bite out of you. At the same time, be prepared for the apes to touch you. They are known to climb aboard for a better view and to take cameras and bags away with them as a souvenir of your visit. Above all, do not attempt to feed the apes. Ice cream bars - - reportedly their favorite - - and other people food were making the apes fat and unhealthy. Consequently, it is now a crime to feed the apes, punishable by a 500 pound fine. During our visit, apes and people mixed freely. 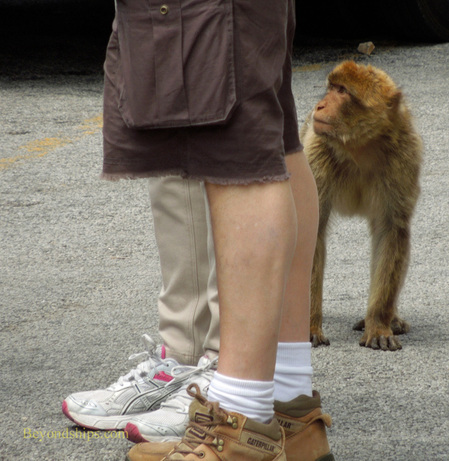 The apes wandered through the crowd displaying a mild curiosity. In fact, what seemed to interest them most was the mini-buses that brought the visitors to see them. They climbed on top several buses and enjoyed the view. When the human passengers re-boarded, the apes stayed put. Nor did they disembark when the buses started moving. It was not until we were well down the road that they decided to jump off. Perhaps we had reached the end of their territory. Perhaps they realized that they had heard our guide's narration before. Visiting the apes does have an added bonus. While their home itself is not particularly inspiring, the view definitely is. 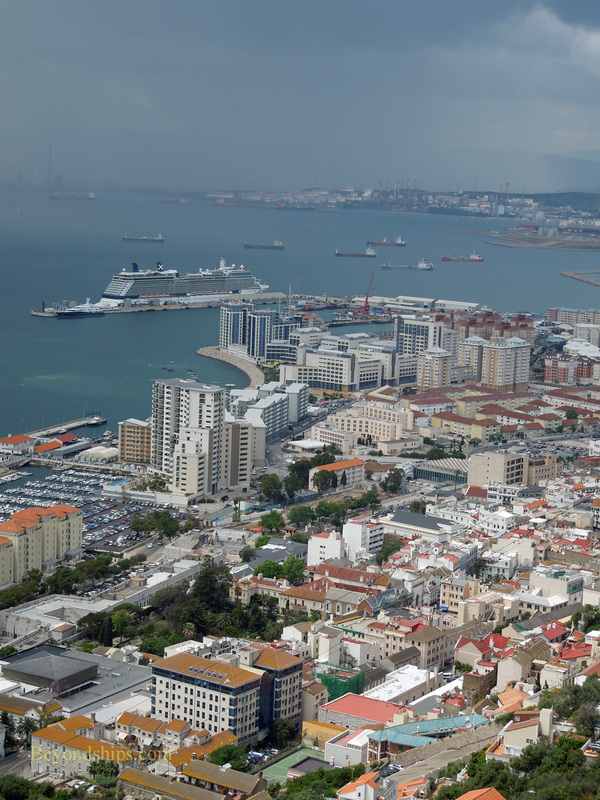 The town, the harbor, the bay, Spain and even Africa on a good day, can all be viewed from the concrete terraces where the apes congregate. In sum, we found our visit to the Barbury Apes quite worthwhile. Yes, you do have to be careful because they are wild animals. But their antics are amusing and because they are so linked to Gibraltar's history and folklore, you cannot really experience Gibraltar without stopping by to see the apes.